Was Martin Luther King Jr a Republican? Does the Social Safety net hurt minorities? Racist Google searches highest in areas where Obama did poorly in 2008. The 2014 events with rancher Cliven Bundy and his refusal to remove his cattle from federal lands has reinvigorated the federal authority/state’s rights debate. 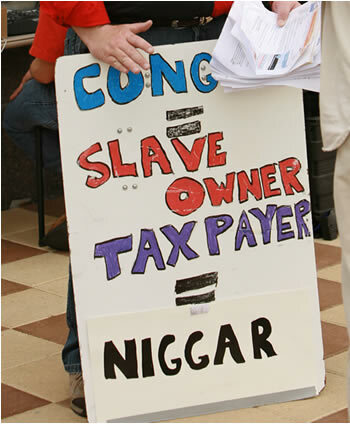 Recent “racist” remarks from Bundy have created a controversy. Most people who vote Republican no doubt vote out of the belief that the Republican Party is the right choice (or at least preferable to Democratic Party). And racist sentiments likely have absolutely no bearing on their decisions. However, it is well established that the Republican Party began catering to racist sentiments in the late 1960’s using tactics that still appear to be in practice (more on this below). What’s more: there certainly appears to still exist a racist Republican voting bloc, and this is largely displayed in the electoral map, where the south came to be dominated by the Republican Party as the aforementioned tactics came into play. 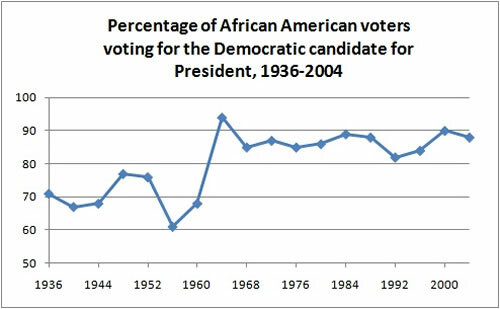 A subsequent switch of African Americans who began voting Democrat due to policy changes in Republican circles intended to gain the ‘anti-black’ vote. After the Act passed, the electorate in the south went to the Republican party. The only exceptions to this are in 1968 when the South actually voted for George Wallace (who ran as an American Independent; a party that had very pro-segregation views) and Jimmy Carter, an evangelist from the South who unlike future Democrats, would have the backing of popular evangelists. You can see the voting trends for yourself below. In other words, the Democratic party indeed used to be the party of racists, but this changed after 1964. Those who attempt to tie the Democratic party to racism rely on the past in order to claim that the Democratic party is the party of racism. Not surprisingly, black Americans have tended to vote for Democratic presidents, with Ronald Reagan and George W Bush making minor inroads with black voters. As African Americans begin turning more and more Democrat, and the Democratic Party becomes more African American-friendly, and the Republican Party begins pandering to disillusioned racists who now switch party affiliation. There exists no shortage of examples on this. 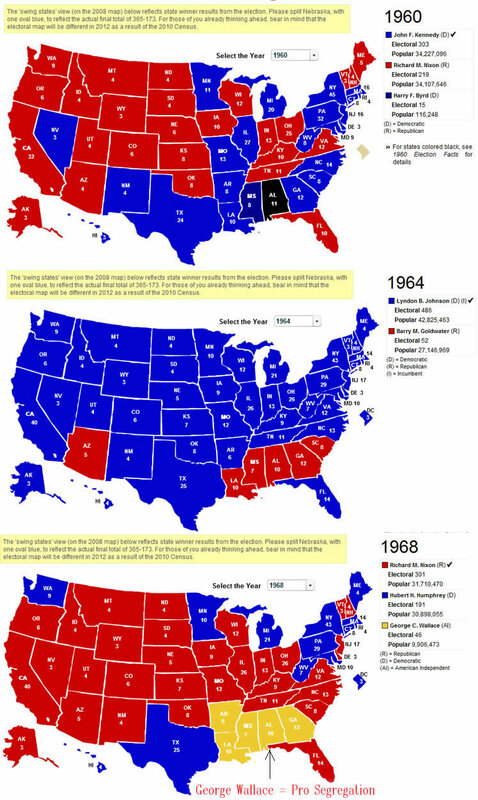 You start out in 1954 by saying, “Nxxxxr, nxxxxr, nxxxxr.” By 1968 you can’t say “nxxxxr”—that hurts you. Backfires. 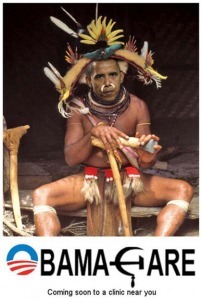 So you say stuff like forced busing, states’ rights and all that stuff. You’re getting so abstract now [that] you’re talking about cutting taxes,and all these things you’re talking about are totally economic things and a byproduct of them is [that] blacks get hurt worse than whites. And subconsciously maybe that is part of it. I’m not saying that. But I’m saying that if it is getting that abstract, and that coded, that we are doing away with the racial problem one way or the other. You follow me—because obviously sitting around saying, “We want to cut this,” is much more abstract than even the busing thing, and a hell of a lot more abstract than “Nxxxxr, nxxxxr“. So much for subtlety! Of course, unlike former Republican strategists, Republican politicians would proceed with caution, using the coded guise of “smaller federal government” to pander to those who despised the federal government’s enforcement of the Civil Rights Act of 1964. Ronald Reagan provides a perfect example. In an attempt to ignore the eventual “party switch” on the topic of racism, some argue that it’s the Democrats who supported the KKK(a recent PragerU video makes this case). This is true, but again it ignores the fact that in the mid-late 1960’s, it would become southern Republicans who supported racist sentiments, and the Democratic party would move away from such support. Just after the 1980 GOP convention, Ronald Reagan visited Philadelphia, MS, where sixteen years earlier, three civil rights activists were murdered. Reagan explained his support for states’ rights, a rallying cry for racists opposed to civil rights laws. In 1980, Ronald Reagan described The Voting Rights Act of 1965 as “humiliating to the South” in his open opposition to the act. Republicans often cite the fact that MLK was Republican. While true, this avoids the simple fact that the political turning point happened in 1964. It should be no surprise that MLK was Republican throughout his life. Below is a video of Martin Luther King speaking about social injustices and the need for a radical redistribution of economic power (read more about this here). This hardly sounds like something from the Republican Party of today. It should also be noted that Martin Luther King Sr, who had been a lifelong Republican, helped Jimmy Carter get nominated as the Democratic candidate for President in the 1976 election. Last but not least, it should be noted, that the Drum Major Institute, founded by Harry Wachtel (and adviser to MLK Jr) and later relaunched by Martin Luther King III after years of inactivity runs the website TheMiddleClass.org, which quite often rates Democrats higher than Republicans on their voting record’s effects middle class.TheMiddleClass.org rates Senators and House Reps on their voting records in regards to matters like public infrastructure, workplace & job creation, college tuition, and more. 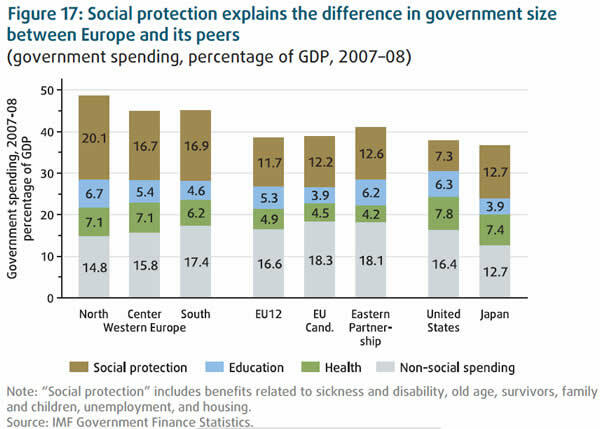 Does the Democratic Social Safety net “keep” minorities poor? A common assertion made by Republicans is that it’s the belief in a social safety net by the Democratic Party that keeps minorities depending on a social safety net instead of obtaining better self-sufficiency. In order for this to be true, it either means that our social safety net somehow keeps minorities from finding work (difficult to imagine since job placement assistance is one of the services offered) or that the existence of a social safety net leads minorities to choose assistance over seeking employment. The latter seems a bit pessimistic and it can just as easily be said that dependence on any sort of government assistance is not something many of those users are proud of. One way to settle this is to look at the poverty data across countries to better understand poverty’s relationship with our social safety net. If a stronger social safety net somehow exacerbates or encourages perpetual poverty, the data certainly doesn’t show this. If anything, it’s quite the opposite. 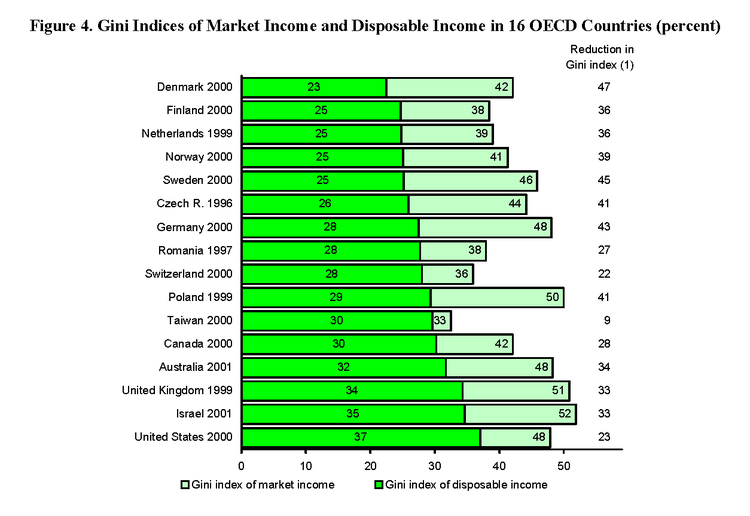 Not only is poverty worse here in the United States than our Industrialized counterparts with stronger social safety nets (in fact, it ranks closer to many developing nations in this area), but upward mobility is also lower. The same generalization holds for all the statistics, but it is important to realize why minorities are not responsible for America’s worse showing. And that is because society’s most visible problems do not stem primarily from race; they stem from poverty. The poor, both white and black, share the same approximate rates of crime, welfare, teenage and single parenthood, substance abuse and other social problems. The rich, both white and black, share many of the same admired social qualities in the same general percentages. Race is only important in that discrimination against minorities has relegated a disproportionate number of them to poverty. It’s common-place to hear free market/smaller government/federalist advocates claim that allowing states (and not the federal government) to pass such acts as the Civil Rights Act of 1964 would actually be better for society. In fact, there appears to be a clear correlation between white supremacy and the free market/smaller government advocates. Just as Reagan expressed opposition to the Voting Rights Act of 1965 citing anti-federal government sentiment, Ron Paul (quite popular among small-government advocates for his own small-government sentiment) cites the same reasoning for his opposition to The Civil Rights Act of 1964. A perfect example of why Ron Paul receives such a low score with The Middle-Class website is his consistent voting against measures which would help middle/lower income people/families, for example; Paycheck Fairness Act of 2008, Employee Free Choice Act of 2007, Fair Minimum Wage Act of 2007, etc (see entire list here). These are a measure which hurt people at the middle/lower end of the pay spectrum, and minorities are overrepresented here. 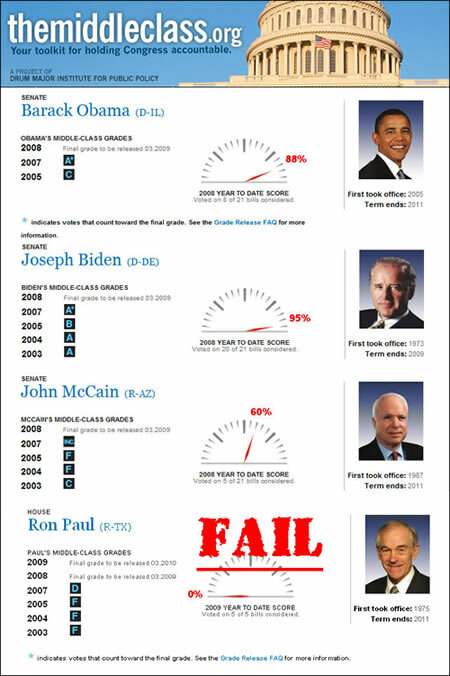 Note, I am not saying that Ron Paul himself necessarily votes this way for this reason, but rather, that there are those who would prefer to see minorities remain there would vote for him for those very reasons. Another common myth repeated by many who oppose the Civil Rights Act of 1964 (their stated reason being that it’s unconstitutional and that it grants the Federal government too much power over our lives) is that the free market would have done a much better job of ending segregation. This is no doubt true by today’s standards. Any restaurant that suddenly refused to serve minorities would result in a media frenzy which would lead to an outrage and boycotts that would likely end in bankruptcy for the restaurant. The problem is: this was not the case in 1964. In fact, under the ethos of 1964, barring African Americans from entering a restaurant would have been a wise business decision, given the number of white customers that restaurant would lose. There would no doubt exist a niche for “black-friendly” restaurants that served African Americans and perhaps had a few “bleeding heart liberal hippy” (by the standards of 1964) white customers, but this would have been a limited market. 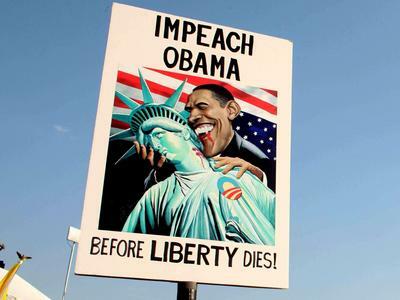 It took the size and scope of the Federal government to end this. Since it’s easy to overlook the progress that’s been made over the last few decades and difficult to imagine an America where this was the ethos, let’s take a look at the approval/disapproval of interracial marriages. According to a Gallup poll, in 1958, 94% of Americans disapproved of interracial marriages and only 4% approved. 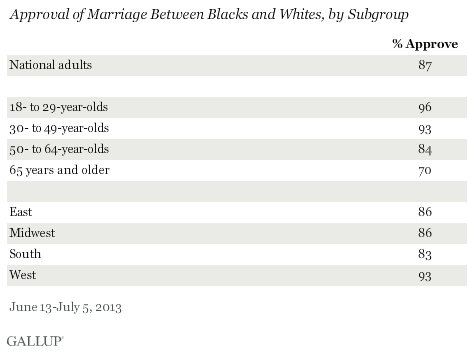 As of 2007 17% of Americans disapproved of interracial marriages and 77% approved. 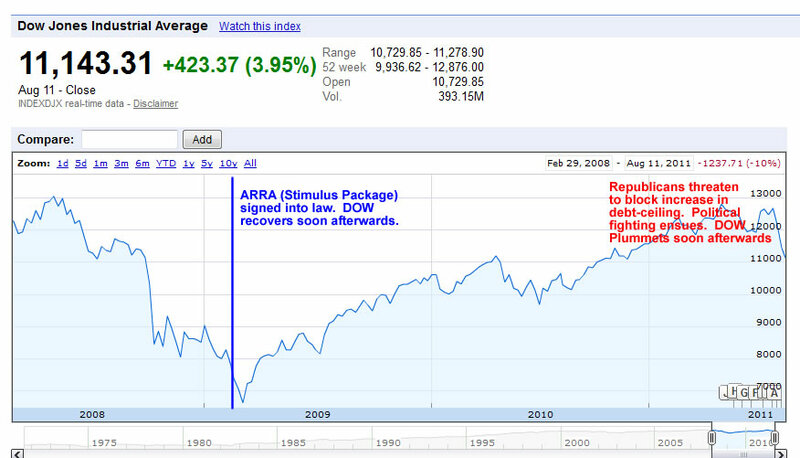 Even the 2007 numbers may seem a bit staggering. But the same Gallup poll breaks these opinions down by age group. The disapproval of interracial marriage is largely among older people in the US (who grew up under the pre-Civil Rights Act ethos). 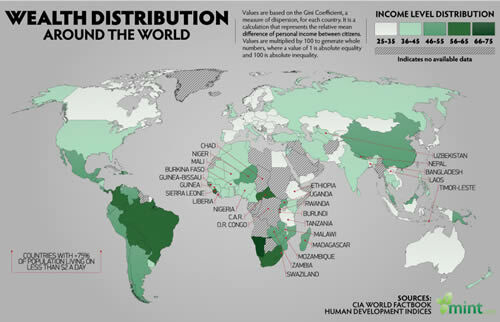 What happens when we break these poll numbers down by geography and political affiliation? Tea Party Racism towards Obama? 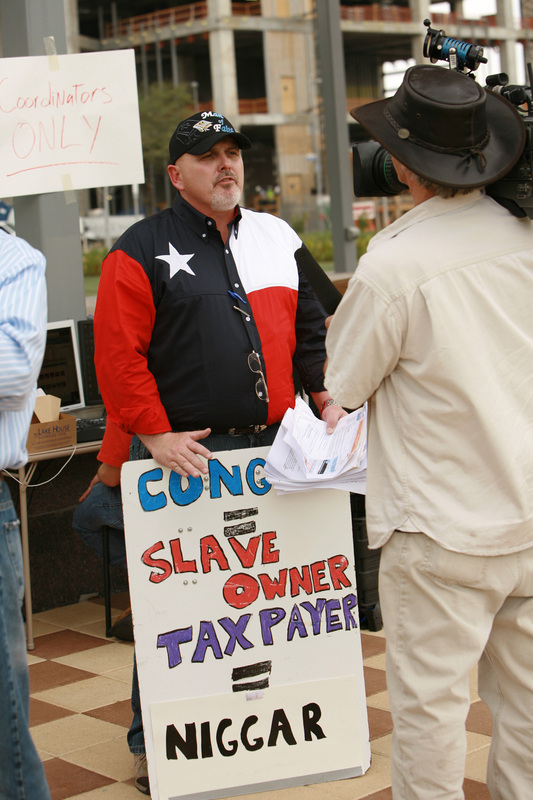 While there are numerous anecdotal examples of racism coming from Tea Party, this in of itself doesn’t prove the entire movement is itself, racist. So how about the Tea Party’s claims that they are merely concerned with the size of government and taxes? 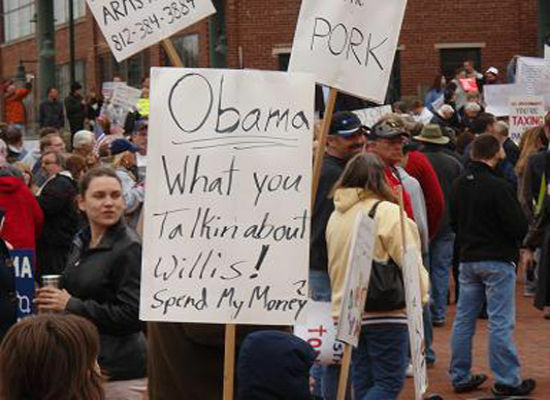 The problem with this is that studies have shown that the Tea Party is amazingly misinformed on both accounts. Oh, and it turns out that fifty-two percent of the Tea Party “believe too much has been made of the problems facing black people” compared to 28 of Americans overall. 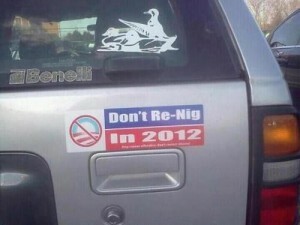 GOP/Republican Congress Racism towards Obama? While it’s almost excusable that the Tea Party is highly misinformed regarding tax rates and the size of government (which they spend so much time railing against), no such excuse exists for Congressional Republicans. 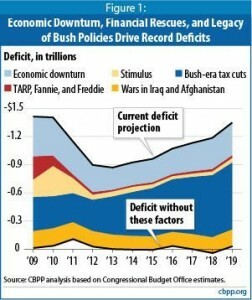 Much like the Tea Party, Congressional Republicans were amazingly silent when George W Bush was president and cutting taxes, sending us into 2 wars, and virtually ever using his veto power. In fact, many of the more outspoken Republicans in regards to our debt (like John Boehner and Paul Ryan were happily going along and voting along party lines for said spending. 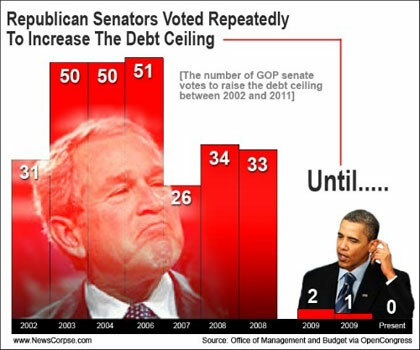 What’s more is Republicans voted 19 times to increase the debt-ceiling (which they later held the economic recovery hostage over). 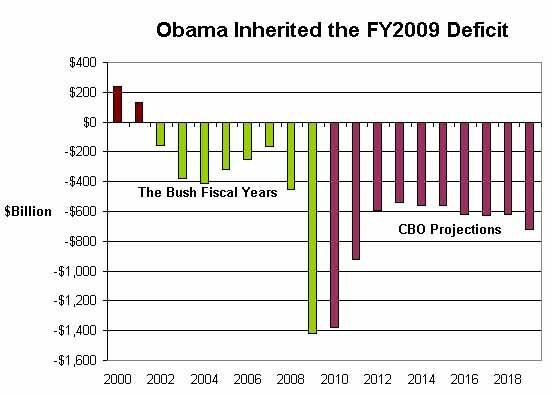 The huge leap in government debt happens in the fiscal year of 2009. 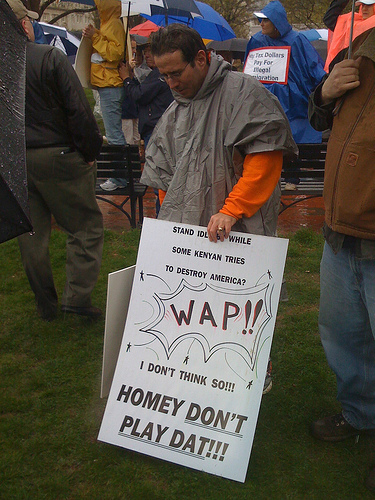 Tea Party members can be excused for not understanding that the 2009 fiscal year started on October of 2008 and hence, the spending for 2009 was largely decided months before Obama would be inaugurated on January 20, 2009 (though one must ask themselves why these people would spend so much time and energy railing against something they didn’t bother Googling). But for Congressional Republicans, such an excuse does not apply. So given that all of the “reasoning” for the GOP’s constant battling with Obama (leaving him so compromise heavily on virtually every issue) is demonstrably incorrect, and that these Congressional Republicans by default should know this (especially since they were the ones who passed much of the legislation that’s led us to this point), one must ask what the “real” reason for this unprecedented political divide. 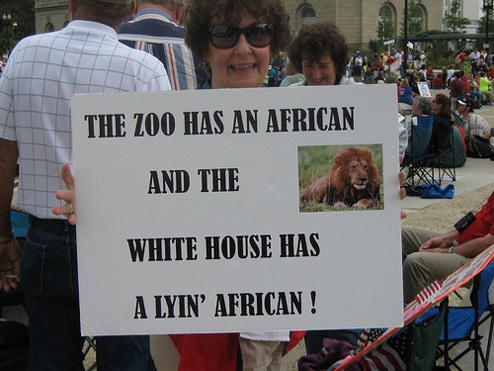 It’s difficult to “prove” that Congressional Republicans are racist (or are merely answering to racist constituents) but their stated reasons for their opposition to Obama simply doesn’t hold (and nor can they reasonably claim ignorance on these matters).